Three Boston University juniors have joined forces to found GrowPro, a startup that aims to develop a device to help home growers cultivate cannabis by providing statistics that are critical to plant growth. The young company is looking to make growing cannabis at home easier for people who wish to do so by calculating biometrics such as light intensity, temperature, soil moisture, humidity of the air and pH levels of the soil in a cannabis plant’s surroundings. That information, which would be transmitted to a mobile app using WiFi, could potentially help growers maintain a suitable environment to get the maximum yield from their plants. 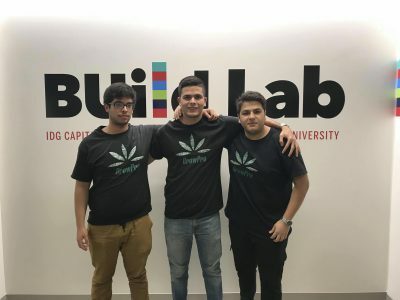 The team first came up with the idea for their product when the BUzz Lab, the predecessor to the current BUild Lab, hosted a competition to find cannabis startup ideas, said Anant Gupta, another GrowPro co-founder, a biomedical engineering major in the College of Engineering. The founders decided to compete in the BUzz Lab’s Cannabis Start-up Competition last November, wanting to expand on their passion for cannabis and to develop an idea that could help others. “… We thought [the competition] might be a good opportunity to put all our engineering backgrounds together and come up with a product that could be very useful for the cannabis industry,” Gupta said. Gupta cited both the support BU has provided the GrowPro team after the contest and the integral roles the BUzz Lab and [email protected] have played in helping them develop their project as critical factors in the group’s progress as a young company. The team now has a minimum value product and has figured out how the sensors, infrastructure and transmission would work. However, they still have certain changes they want to make, Gupta said. They hope to implement those changes as part of the Summer Accelerator program at the BUild Lab, where they would try to minimize their hardware and solidify the software they are using while developing a more concise business strategy. While the members of the team have the required skills for the technical side of the project, the resources offered by BU have been immensely helpful to them in developing the business side of their startup, added Francis Zamora, the third co-founder of the group, who is studying computer science in CAS. At this point, the group’s next steps mostly involve raising funds for their company, Zamora said. GrowPro is currently competing in the final round of [email protected]’s New Venture Competition for $15,000 in prize money. Renato Mancuso, a BU computer science professor, offered the team additional support. Zamora had worked on a similar project for his class, which resulted in their focus on the GrowPro project, Mancuso wrote in an email. Zamora reached out to Mancuso multiple times after class and Mancuso granted him unrestricted access to a space in the lab, where he could work on developing GrowPro. “I also encouraged him to tap into my own knowledge of embedded systems development, as well as into my (limited) expertise in business development,” Mancuso wrote. Being mindful and aware of the unknown when working on a business project is an important part of the development process, Mancuso has been reminding the team as they look to improve their product. Chopra said he thinks the value and importance of startups and independent businesses makes being in one exciting, especially as the business develops further. Hack For Homescapes Which Works. Hello and welcome.